$600 No-Limit Final Table Now Streaming Live! We have reached the final table of the $600 No-Limit Hold 'em event at the Foxwoods World Poker Finals. The blinds are currently 12,000-24,000 with a 4,000 ante and the average chip stack is 908,000. The players in the $600 No-Limit Hold 'em event have returned from dinner break and cards back in the air. The blinds are now 10,000-20,000 with a 3,000 ante. With 15 players remaining, the average chip stack is now 605,000. We had a total of 251 players in today's $500 Seniors No-Limit Hold 'em at the Foxwoods World Poker Finals. The final 27 spots will finish in the money. There are currently 180 players remaining with the blinds at 200-400 with a 50 ante. Day 2 of the $600 No-Limit Event Now Steaming Live! 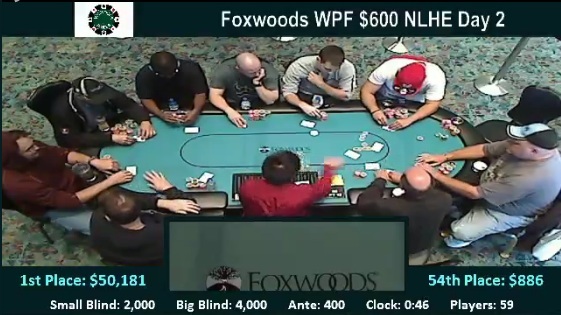 The final day of the $600 No-Limit Hold 'em event at the 2012 Foxwoods World Poker Finals is now streaming live. To watch the live feed, just click on FoxwoodsLive.com. With 58 players remaining and top 54 spots cashing, we are approaching the money bubble.